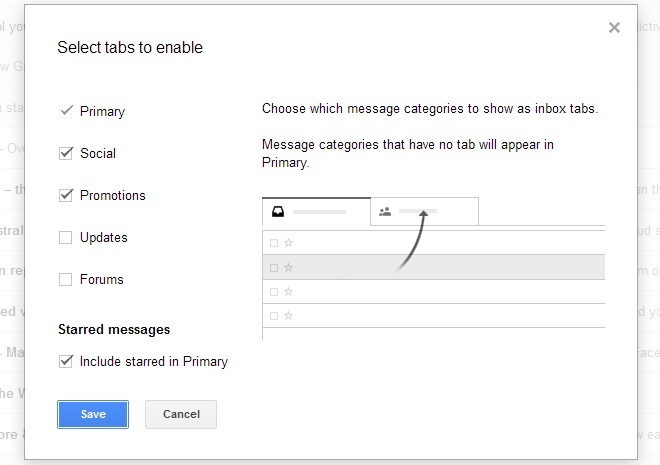 If you use Gmail for your e-mail, you have probably noticed that Gmail recently changed its inbox to help automatically sort your mail using tabs (Primary, Social, Promotion, Updates and Forums). Although this is a very helpful change, what this means is that you are no longer in control where your e-mails will go or how they will be sorted for you. Before this change, all of your e-mails went into one place (your main inbox). Step #1: Drag this e-mail from your “Promotions” tab and drop into your “Primary” tab. Step #2: An alert will pop up, prompting you to confirm this change permanently—select “Yes” and that’s it! You’re all set! And, if you haven’t done so already and you would rather just turn off this new feature entirely, there’s a way that you can do that too. See below. Make sure that only the “Primary” tab is selected (with a checkmark). Click “Save” and you’re good to go! We hope that this helps you have better control of your e-mails and the e-mails you want to see. If you’re not already subscribed to our free monthly e-mail newsletter, click here.